Ice Cream at the Sweet Shoppe in Riverton. A simple pleasure on a hot July day is a visit to the Sweet Shoppe in Riverton for some smooth, cool ice cream in your favorite flavor. Walk into the Sweet Shoppe, wipe the sweat from your brow and plunk down $2.55 for a coconut almond fudge double ice cream cone. Or for $3.25 maybe you prefer a genuine malted milkshake. It is not surprising that many Barkhamsted residents often make a pilgrimage to the Sweet Shoppe, buy some ice cream and sit outside watching the world go by in downtown Riverton. Owner Shirley Scarpino, herself a Barkhamsted resident, says that in July the most popular item is of course the ice cream cone, with milkshakes a close second. Ice cream is available in 24 flavors* and is a "French premium" style ice cream from the Bucks Ice Cream Company. 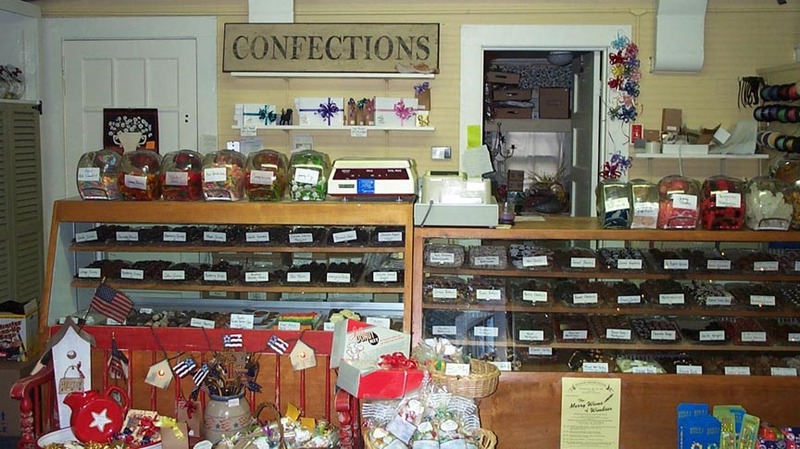 Photo- the Sweet Shoppe, Riverton, Connecticut. 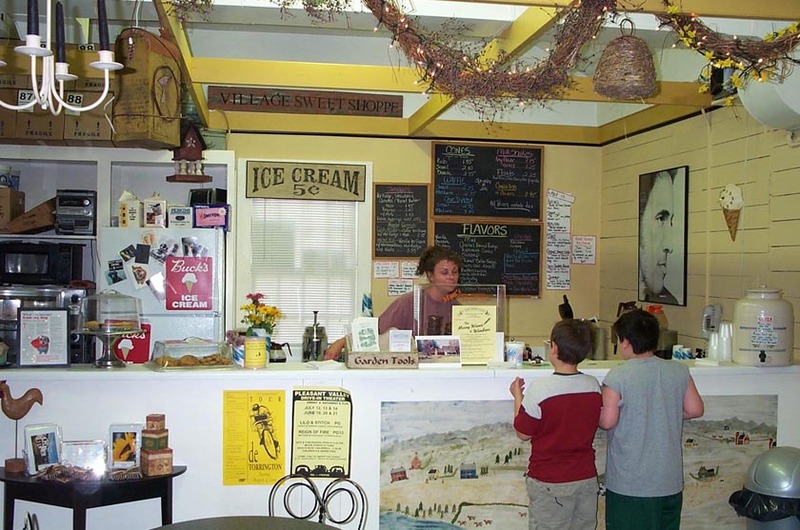 The ice cream business is brisk in summer from the many visitors drawn by Hitchcock Chair and the other Riverton shops. But Shirley says that she also sees regulars from the local area. There are weekday regulars and weekend regulars, and they know what they want. They tend to get the same item in the same flavor on each visit. Shirley says that many of the ice cream flavors are offered throughout the summer, but about every two weeks she will replace a couple with new offerings for the sake of variety. Some ice cream flavors are seasonal such as pumpkin and eggnog in the fall. 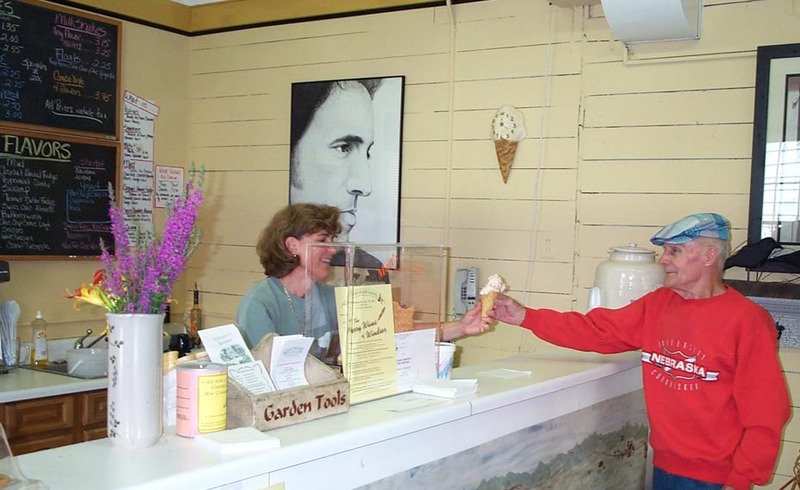 Photo- Shirley serving a strawberry ice cream cone to Bob Rice of Colebrook. Shirley has operated the Sweet Shoppe for 12 years and loves the Riverton location. She enjoys knowing her customers and seeing them on a regular basis. Besides ice cream (cones, shakes, sundaes, floats), yogurt, sherbets and cookies, Shirley has an extensive offering of chocolates and other candies. In addition she sells gift items, many with a country motif. During the colder months the candy and gifts are much more popular but Shirley says that even in winter it is surprising how much ice cream is purchased. Photo- let's see now, what do I want? Photo- the candy counter. Wonder why this place is called the Sweet Shoppe. A variety of customers of all ages frequent the Sweet Shoppe and arrive in cars, on bikes and on foot. Campers and hikers from the nearby state forests frequently drop in for a cool treat. But the most unusual arrival was a gentleman on a speeding motorcycle that was going so fast he could not negotiate the curve in the center of Riverton. Shirley happened to be chatting with some customers outside the shop in the parking lot and watched as the motorcycle came roaring around the corner. Unable to stay on the road, the rider lost control of the motorcycle and went down, sliding to a stop in the Sweet Shoppe parking lot. As he came to a halt and still sprawled on the ground with the motorcycle, the man looked up and said, "Well, I guess I'll have an ice cream! ".